Most of the time when I’m sent a product to review, I like it. Sometimes, though, I love it. A tell-everyone-I-know type of love. The most recent thing that caused this reactions was sent to me by Bambu, a company that makes kitchen and eating tools out of–you guessed it–bamboo! In case you didn’t already know, the benefits of using the bamboo plant are incredible. It’s an extremely fast growing plant (overall, it’s estimated that the varieties of bamboo in general grow at a rate of 2″ per HOUR), doesn’t require the use of pesticides (though some growers will use it), and is largely versatile in its uses! So what is the item that’s brought me such joy, you ask? 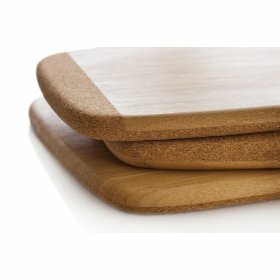 A bamboo and cork cutting and serving board–their Medium Hybrid one, to be exact. One side is bamboo with the cork coming around the long edges, and the other side is made of a smooth cork. Antimicrobial and not dulling your knives, this board allows you to have a beautiful way of presenting food on the table, as well as an amazing surface for cutting on! We have chosen to only cut on the bamboo side so to keep the cork side smooth, and we can’t even see marks on the wood from our knives! The cork side is great to keep the board from skidding across the countertop, and I love that it’s also a natural substance. Frankly, I will never go back to another cutting board now. My plastic and glass ones were retired as soon as I tried this baby. You are supposed to do a little maintenance on bamboo boards by rubbing them with oil once in a while to protect the wood, but I’m thinking that’s such an easy thing compared to spending 10 minutes trying to scrape out food caught in the cut marks on my plastic board…and I don’t have to think of any nasty chemicals leaching into my food, or surfaces that will dull my knives. Buy It! Click the Amazon picture above to purchase the medium board (or buy the large one for $43.95). Seriously, buy it. I don’t say that too often. Win It! Bambu is generously going to bless one of my readers with his or her own Hybrid board. To enter, you must visit their website and tell me where you can buy their products at. You must do this before any other entries will count. You must also leave a separate comment and an email address for each entry or they won’t count. Contest ends January 11th at noon, EST. *Otherwise spread the word and tell me how you did! PS- Keep watching for some more AWESOME reviews and giveaways of Bambu products–particularly their Children’s line! While Bambu provided free samples for this review, all of the opinions are mine! Enfamil Court Case–are you a wise consumer? My local store that sells their product is Charleston Cooks. I love bamboo kitchen ware. I could go to Earth Mart, which is such an awesome store, in Pheonixville, PA and buy this, but I'm hoping I'll win it! Thanks for the giveaway. Here in Columbus, their products are sold at Whole Foods. I could buy their products at two locations close to me in Tempe: Changing Hands bookstore and Whole Foods. I'll check Bambu's products out next time I'm either of those stores. I like both places a lot.